This kind of poetics would seem very much like a book of trigonometry to a child who just wants to draw pictures. These concepts of Schlegel, however fragmentary and disjointed they may be, when placed in historical perspective constitute a clear polemic with the normative poetics of classicism – the inspirational role played by the Weimar Romantics should be remembered (for example the Goethean model of the Bildungsroman or Schiller’s opposition between naïve and sentimental poetry) as should the influence of the old quarrel between the ancients and the moderns on the shaping of modern poetry’s sense of autonomy. In the context of the struggle against normativism, the emphasis placed by the Romantics on the theory of the novel is significant; the novel is a hybrid form, which remained a marginal phenomenon for poetics developed in the spirit of Boileau’s “L’art poètique.” “Only a pedant is interested in labels,” snarled Schlegel, projecting his ideal of poetry as a novel-mélange: “I cannot imagine the novel as anything other than a mixture of narrative, song, and other forms” (BR). He postulated a multifaceted syncretism – under the aegis of the novel were to be reunited “all the separate species of poetry,” but it was important also to “put poetry in touch with philosophy and rhetoric” (F 175). The subversive spirit of progressive poetry was also not unrelated to the social transformations under way at the time: “Poetry is republican speech” (F 150), Schlegel declared, after which he pointed to the French Revolution (together with Fichte’s Theory of Knowledge and Goethe’s Wilhelm Meister) as “the greatest tendencies of the age” (F 190). According to the authors of The Literary Absolute, for the German Romantics “literature or literary theory will be the privileged locus of expression” of their responses to the social and religious crises of the epoch. At this point, however, easy diagnoses exhaust themselves; the principle of a “poetical poetics” appears lucid only when used as an organizing shorthand. Lingering over any one of its key postulates reveals contradictions and indistinctions related not only to the natural tendency of opinions to vary, but also to remaining under the spell of an artistic “philosophical quasi chaos” (F 225), a chaos out of which emerged such hybrid shapes as the grotesque, and such capricious forms as the arabesque, impossible to encompass in the form of an aesthetic synthesis. The fate of the Jena Romantics’ main genre initiative, i.e., the novel, is instructive; as Henryk Markiewicz mildly put it, the novel was “the potentially crowning genre, the highest, synthesizing, with the most glorious future.” This concurs with Schlegel’s belief that “only completely essential genres can be bred from pure poetics” (LN 23)… but, as it turned out, the phenomenon exists only in its “potential” for realization, if that. The Romantics’ thought thus escapes into the future, the theory of the novel does not constitute a conceptual enclosure for existing literary realities, but merely an attempt to raise its power for metadescription. The productivity of theory thus seems minimal (especially when compared to the later manifestoes of realism or naturalism) – Schlegel’s concept of a novel about the novel, referencing the tradition of Cervantes, Diderot, and Sterne, remained, at least until the era of modernist novelistic experiments, an under-verified hypothesis. In one of the fragments published in Athenaeum, Schlegel discusses the “principles of pure poetics” (F 198) in somewhat greater detail. It originates from the “absolute antithesis of the eternally unbridgeable gulf between art and raw beauty” (F 197). “A real… theory of poetry,” quite smoothly turning into a “philosophy of poetry,” “would waver between the union and the division of philosophy and poetry, between poetry and practice, poetry as such and all the genres and kinds of poetry; and it would conclude with their complete union” (F 198). From this less than crystal clear argument emerges the outline of a dialectic reading from the “absolute antithesis” through “wavering” to “complete union,” which, it is hard not to conclude, would have been the subject as well as the method of the final “Romantic book,” or novel. Both the goal and the start of this dialectic are postponed, expressed in the future tense or in the conditional mood. Actual theory must be replaced by “a divinatory criticism” (meaning a prophetic one: “Criticism is the mother of poetics,” LN 81) – only it “would dare try to characterize its [poetry’s– WH] ideal” (F 175). We cannot grasp the object (poetry) or its description (poetics), because they do not yet exist in reality, but they do have a virtual existence in form’s borrowing of a fragment that refers to a suggested, unattainable whole. One medium that renders possible its substitutional manifestation can be the “explosion of confined spirit” (F 153), called Wit, a “prophetic faculty” (F 159), allowing “the sudden meeting of two friendly thoughts after a long separation” (F 166), or slightly less sprightly allegory (Allegorie), that “put the abstract in didactic dress” (F 218). The “unbridgeable gulf” that keeps “raw beauty” from being revealed can be artistically crossed through an extemporaneous, fragmentary poetics of impossible poetry, which in many places, through its projection into the misty future, changes into the indistinct outline of a poetics of this impossible poetics – this procedure is in keeping with the rules of the evasive dialectic, which has the potential to duplicate itself ad infinitum, and only asymptotically approaches the desired synthesis. 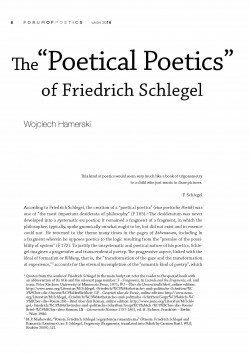 It can therefore be said that Schlegel has a theory of poetry, though at the same time he has none, which seems to fit nicely with his penchant for paradoxes that strike at classical logic: “It’s equally fatal for the mind to have a system and to have none. It will simply have to decide to combine the two” (F 167). It looks as though a pure poetics does not mean a clear poetics. To say that one fully understands it would amount to confessing that one is a “harmonious bore” (F 154), allowing oneself to be caught in the trap of logical signification that the writer’s thought stubbornly avoids. Fragmentation and non-systematization, the dialogical and paradoxical nature of the philosopher’s sphinx-like arguments, are a challenge thrown to the reader, who is thus charged with the responsibility for finishing the work through the process of chewing and digesting (those are the favorite organic metaphors for reading used by the author of the Fragments) the fragmentary texts with their provocatively open construction. The strategy of argumentation adopted by Schlegel in the pages of Athenaeum, the programmatic periodical of the German Romantics, gave rise to unfavorable commentary, condemning its lack of elementary transparency in thought. Curiously, Schlegel already anticipates those charges in his earlier Lyceum: “German books become popular because of a famous name, or because of a great personality, or because of good connections, or because of hard work, or because of mild obscenity, or because of perfect incomprehensibility” (F 152). We can guess that the philosopher wittily recognizes in himself an inclination toward this last. Complaints regarding the opacity of the pieces written by Schlegel in Athenaeum came not only from the reading public but even from colleagues and co-founders of the magazine, including Friedrich Schleiermacher, who attached great importance to understanding as part of a hermeneutic strategy. To Schleiermacher’s critical remarks on the obscurity of his “Idea,” Schlegel answered reassuringly: “That means a lot that you didn’t understand them […] such premature clarity is harmful to your health.” It would be hard to accept such assurances if one were not well acquainted with the basic principle of Schlegel’s writing – incomprehensibility is not something that happens to his texts unintentionally, but is rather their main subject and decided creative principle. The direct response of the Fragments’ author to the charges against them was his essay “On Incomprehensibility” (1800), published in the last issue of Athenaeum. The text is occasional in nature, and simultaneously a manifesto; it unmasks and calls by name the source of the unreadability that maintains the poetological (non-)system in a state of “dynamic paralysis.” It is irony: “The incomprehensibility of Athenaeum is due, to a great extent, to the irony, evident more or less everywhere inside it” (ÜU). It manifests itself everywhere, and thus is not a local figure or trope, but rather a “mood that surveys everything and rises infinitely above all limitations” (F 148). It is the parabasis, which “in a fantastic novel must be permanent” (LN 65), that is, the persistent demasking of the narrator, shattering the mimetic coherence of his reasoning, and “transcendent buffoonery,” a form of surpassing oneself, expressed in the celebrated fragment 116 by the metaphor of soaring (schweben), to “hover at the midpoint between the portrayed and the portrayer on the wings of poetic reflection, and can raise that reflection again and again to a higher power, can multiply it in an endless succession of mirrors” (F 175). A consequence of the ironic dialectic of the self for the theory of poetry is the removal of the conceptual barrier that would protect the “poetical poetics,” that is, the poetics of the impossible poetics of impossible poetry, from sliding into a poetics of the impossible poetics of the impossible poetics of impossible poetry, and in fact the process of theory’s formulation/deferral need not end at that point. The grasp of irony as an expression of the “divided spirit,” i.e., a form of creative “self-limitation” representing “self-creation, and self-destruction” (F 147), was inspired by three advances made by the idealistic dialectics of the subject, Johann Gottlieb Fichte’s “guiding principle of the theoretical science of knowledge.” Romantic irony should not, however, be reduced to an aesthetic application of a philosophical system – although the first critical reviewer of the concept of “transcendent buffoonery,” Georg W.F. Hegel, observed that Schlegel had managed to take the position set forth in Fichte’s Theory of Knowledge and “develop it in a peculiar fashion and…tear himself loose from it.” The key difference is revealed precisely in the resignation from a complete system. Schlegel’s thought feels best in medias res; it resists the philosophical temptation to search for first principles (which in Fichte too the form of the absolute establishment of the self): “philosophy, like epic poetry, always begins in medias res” (F 171). It is precisely irony that, as a “practice of resistance to paradigm, reference, and taxonomy,” is responsible for the chronic openness of the model of progressive poetry, despite the fact that the concept of “transcendent buffoonery” is neither the main subject nor a primary concept in the Romantic’s argumentation. Consolidation would mean the end of irony, disloyalty to the principle of distracted thought, according to which “there is no particular concept at the center of Schlegel’s work, but rather the ceaseless play of multiple concepts.” However, as the writer of the fragments reminds us, irony appears in them “more or less everywhere.” Being in variable and unclassifiable relationships with other concepts important for the author (such as reflection, wit, or allegory), it remains a continuously active force in hiding, as in the works of his adored Shakespeare, bristling with “captious snares” (ÜU) of irony. On Incomprehensibility pulsates with this double life of irony, both at the surface and deeper down. Schlegel talks about irony more openly than in any preceding work and even performs a survey of “its greatest genres” in order to “help orient readers inside the entire system of irony” (ÜU). He does so just moments after criticizing the taxonomical inclinations of other philosophers (he compares Immanuel Kant’s table of categories to the kabbala: “And in the human soul there was light,” ÜU). Resolving to establish order in the “system of irony,” Schlegel in a way anticipated the future fate of his own conception, which has been subjected to terminological petrification (Schlegel did not use the term “Romantic irony”), reduction to an “aesthetic position,” and genre codification, classifying individual efforts “in the sphere of literary rules” (for example, the digressive narrative poem). There is a dollop of historical irony in the fact that after the author’s death, “divine irony” underwent assimilation into the systematic (structural) poetics against which it had rebelled. Thick, thin, ultra-subtle, straightforward, dramatic, double (for the exclusive box seats and the groundlings), irony within irony – the lecture on chaotic genre theory in “On Incomprehensibility” seems itself ironic, though the author denies it (“When we talk about irony without irony, as has just taken place…”), only to change his opinion before the sentence has reached its conclusion (“…at the same moment we fell upon a different and considerably more vibrant [irony–WH]; when there is no way to get away from irony, as appears to be happening in this sketch on incomprehensibility” ÜU). Schlegel’s reasoning is provocatively contradictory, as he practices irony while discussing it – he dramatizes the metaphor of mirrors facing each other, leading up to the moment at which “irony goes wild and we lose control over it” (ÜU), and darkness falls on the reader’s soul. This local blurring of meaning mirrors the structure of the essay as a whole, wherein Ososiński shrewdly perceives “something like a rupture” – at first Schlegel ridicules his readers who complained about the incomprehensibility of Athenaeum, then he makes a sudden turn and offers an apologia for incomprehensibility, beginning with the question: “So is incomprehensibility really such a wicked and worthless thing?” (ÜU). We have no way of unambiguously determining what Schlegel’s attitude toward incomprehensibility was, but we should not disregard the prophetic note that sounds throughout the whole text, even if it is expressed in a jocular, buffo form. “The lightning on poetry’s horizon was long,” but the day on which “the whole sky will flare up in one flame” is yet to come – Schlegel scans in a tone that would make a Futurist manifesto proud – “a new, quick-legged epoch with winged feet announces its coming; daybreak has put on its seven-mile boots” (ÜU). In this vivacious new era, the Fragments will be relished “during digestion after lunch,” meaning that the time of utter and total communication will come, so for real, though it is unknown whether this prediction is serious, especially if we take seriously the earlier postulate of “purely and faithfully” maintaining “a shred of incomprehensibility.” Schlegel’s divination twists and turns like an arabesque pattern, changing the direction of its prognosis without warning: “If I have correctly understood the signs that destiny seems to be leaving, then soon a new generation of little ironies will be born. Yea, verily, the stars speak of singular times” (ÜU). The German philosopher’s historical firmament is full of contradictory “signs of destiny.” There is thunder and lightning on the horizon, announcing an epoch full of understanding, but the stars foretell a time of irony, veiling the universe in incomprehensibility. Schlegel’s sky is a panopticon of contrasting phenomena, that should be interpreted prophetically as signs – that is the scenario of reading we find in the essay “On Incomprehensibility,” which in fact provides instructions on how to read Fragments, themselves a lecture in “poetical poetics,” or a general theory of reading. “Irony is the clear consciousness of eternal agility, of an infinitely teeming chaos” (F 247) – thus begins Schlegel’s literary cosmogony. Such chaos, to the Romantics, represents “the inexhaustible potency of spiritual plenitude – it was a kind of record of everything that was to happen or could happen.” From the chaos of unreason emerges reason, which should nevertheless not be overestimated, since understanding takes place at the cost of an unavoidable reduction of the universe’s richness. Irony serves to return to words and things their state of desired potentiality and to push the audience into an active state. Meaning only emerges thanks to the reader’s interpretative and divinatory activity, directed toward the future and toward a(n) (im)possible synthesis of sense. Schlegel, Ososiński comments, attempts to “contain in his text simultaneously two mutually exclusive extremes and to put the reader face to face with those irreconcilable options.” The role of the reader in the constellation of Schlegel’s provocatively murky arguments is completely crucial: “I resolved long ago to enter into a conversation with the reader and in front of him, beside him, construct a different, new reader in my own image – ha, if necessary, to infer him” (ÜU). The malice of his remark aimed at Athenaeum subscribers does not undermine the weight of his invitation – the chief thing is to “enter into a conversation.” The dialogical aspect – visible, for instance, in “Conversation on Poetry”, presenting a range of voices, none of which (in contrast to the Platonic model) has a dominant position – for Schlegel forms the basis of sympoetry, the art of “fusing together individuals” (wittily expressed in the idea of joining Jean Paul and Ludwig Tieck in the figure of a single author) consisting of, among other things, “tempting” the reader, as someone “alive and critical” (F 157), to participate in creating the work. The concept of sympoetry completes the theory of progressive poetry with an element of team spirit, though it simultaneously decrees the idiosyncrasy of the act of reading. A work is created, to put things in Ingarden’s terms, as a result of concretization, filling in “places of indefinition”; from each reading emerges a different whole. From this insight, far from earth-shaking for a contemporary reader, the Romantic draws the following theoretical consequences – since the purpose of poetry is “eternal becoming,” classically understood poetics is pure usurpation, killing the republican spirit of Romantic verbal art. The only alternative is theory drawn directly from the poem or novel on which it is to touch, being of necessity a single-use system. Romantic irony thus has a testing structure: Schlegel renews his attempt to engage the reader in a dialogue, forces him to participate, demands that he take a position. One can complain that the terms of the conversation are not entirely fair, since its initiator shows a “lack of real involvement,” and himself avoids making a commitment to either side. Commentators on Schlegel do not have that luxury; an implacable rule of the discourses of philosophy and literary scholarship insists on striving for relative intelligibility – even books should be more or less comprehensible, especially for reviewers or academic readers and advisers. Nonetheless, it would appear that the perspective is wider; Schlegel knows that “the poet’s irony becomes irony about him” (ÜU), that he does not have supreme authority as arch-ironist, and the ideal of clownish detachment, absolute distance, schweben, being on both sides at the same time, is more the hypothesis than the reality of the Fragments – the ironic dialectic has, after all, been mediated in the tried-and-true figures of understanding such as fragment, allegory, paradox, and so on. The intention of incomprehensibility must remain comprehensible, hence the movement toward “an absolute synthesis of absolute antitheses” (F 176) is conventional in nature. Negotiating this issue Schlegel notes, “a shred of incomprehensibility suffices” (ÜU). If one were to generalize about the interventions of interpreters geared toward pulling Schlegel further to the side of creation or destruction, and use the symphilosophical method of “fusing together individuals” to put them onto a single canvas, it would be quite a good metaphor for irony, defined by the Romantic as “the continual self-creating interchange of two conflicting thoughts” (F 176). The dispute over Schlegel is reminiscent of a tennis match where the players bounce the ball back and forth between the two sides of the court, unable to reach a decisive outcome. The philosopher himself, it seems, is interested in the perspective of the ball balancing on the net, the eternal “no”. Only the virtuosic balance between “what is represented and the law of representation” (F 207), the “possibility or impossibility” of full communication (F 259) manifests itself as a truly ironic, and simultaneously poetical and theoretical, solution. Unfortunately, the ball does not stay on the net, and a coin flipped into the air eventually loses momentum and lands, showing only one side. “In order to be one-sided, we at least need to have one side” (F 209). Though this opinion polemicizes with the “harmonic bores,” it is hard not to see the dormant potential for self-irony within it, regarding the poetic project that resembles the doomed yet intensely renewed effort to see the table-top from both sides simultaneously. Were it to be written, the handbook of “poetical poetics” would be the absolute book, the novel-encyclopaedia, about which the Jena thinkers repeatedly fantasized. It would have to take under its wing the postulated totality, despite the fact that “there is no primary language, in which this totality could be described”; it would therefore be a definitively paradoxical publication, and as a result, an unreadable one. It would resemble the book containing all the mysteries of the future life of the protagonist of Novalis’s novel, Heinrich, who flipped through it without understanding: “The book pleased him immensely, though he understood not a single syllable of it.” “Pure poetics” are digestible reading only for “readers who know how to read” (ÜU), who in “On Incomprehensibility” are the object of a divination that is less than completely serious – for the time being, humanity is merely an “awkward novice.” Poring over the pages of a “poetical poetics,” we would thus feel ourselves to be superficial dilettantes, children unable to form letters: “This kind of poetics would seem very much like a book of trigonometry to a child who just wants to draw pictures” (F 198). Schlegel is supposed to be writing a textbook, but in fact he has not stopped drawing pictures; he is drawing dialectical triangles and triangles within triangles, ironic fractals, of which it is difficult to say whether they bring us closer toward or further away from the posited ideal of a pure and poetical poetics. The creation of a “poetical poetics” was one of the personal postulates of Friedrich Schlegel that never achieved full execution. The Romantic thinker’s fragmentary thought, sparkling with paradoxes, does not easily submit to synthesis. 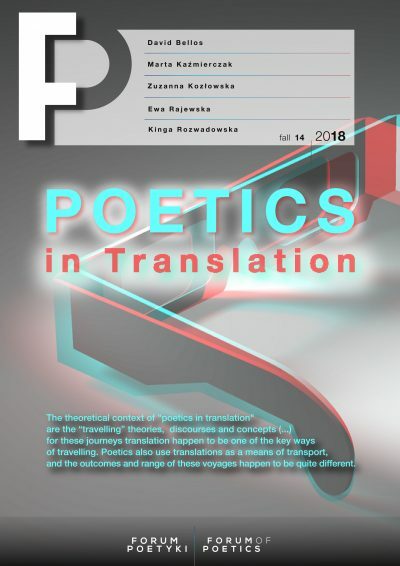 The purpose of this article is to present the poetological reflections of the author of Fragments as a constellation of concepts interconnected non-systematically, which in a historical sense represent an indirect response to the normative poetics of classicism. The theoretical reflection of the Jena Romantics, in accordance with the spirit of “progressive poetry,” adopted a provocatively open form. Thoughts concerning literature itself (the ideal of the mixture-novel), like the language of description of that same literature (the ideal of a “pure poetics”), instead of striving to reach conclusions, manifest their own inconclusiveness. In defense of an open poetics, remaining in constant motion, stands “the freest of all licenses”, irony, which not only forms the subject of many of Schlegel’s fragments, but also functions as the very principle of their construction. Quotes from the works of Friedrich Schlegel in the main body text refer the reader to the quoted book with an abbreviation of its title and the relevant page number: F – Fragments, in Lucinde and the Fragments, ed. and trans. Peter Kirchow, University of Minnesota Press, 1971; ÜU—Über die Unverständlichkeit, online edition: http://www.zeno.org/Literatur/M/Schlegel,+Friedrich/%C3%84sthetische+und+politische+Schriften/%C3%9Cber+die+Unverst%C3%A4ndlichkeit; GP – Gespräch über die Poesie, online edition: http://www.zeno.org/Literatur/M/Schlegel,+Friedrich/%C3%84sthetische+und+politische+Schriften/Gespr%C3%A4ch+%C3%BCber+die+Poesie; BR—Brief über den Roman, online edition: http://www.zeno.org/Literatur/M/Schlegel,+Friedrich/%C3%84sthetische+und+politische+Schriften/Gespr%C3%A4ch+%C3%BCber+die+Poesie/Brief+%C3%BCber+den+Roman; LN – Literarische Notizen 1797-1801, ed. H. Eichner, Frankfurt – Berlin – Wien 1980. M.P. Markowski, “Poiesis. Friedrich Schlegel i egzystencja romantyczna” (Poiesis. Friedrich Schlegel and Romantic Existence), in: F. Schlegel, Fragmenty (Fragments, translated into Polish by Carmen Bartl, WUJ, Kraków 2009), LII. P. Lacoue-Labarthe, J.L.-Nancy, The Literary Absolute. The Theory of Literature in German Romanticism, trans. P. Barnard I C. Lester, State University of New York Press 1988, 12. Hans Robert Jauss talks about the “paradox of the history of German literature” consisting of the fact that Schlegel, co-founder of the Romantic revolution, “in the course of his explication of what is interesting, as the principles of modern art […], he returns halfway toward the ideal of classicism” (H.R. Jauss, Literaturgeschichte als Provokation, Frankfurt am Main: Suhrkamp, 1970). Jauss’s assertion relates to an earlier work, Über das Studium der grechischen Poesie (1795), but it is worth noting that Schiller’s profound consideration of the concept of irony, with which my article is to a large extent concerned, developed primarily in the years 1797-1800. P. Lacoue-Labarthe, J.-L. Nancy, The Literary Absolute, 5. H. Markiewicz, Teorie powieści za granicą (Theory of the Novel Outside Poland), Warszawa 1992, 85. According to Michał Paweł Markowski, there are two ways of understanding the relationship between literature and philosophy in Schlegel’s writing. The first posits the utter identification of literature and theory (and, therefore, philosophy, as the most generalized form of theoretical thought), while the second underscores the mutual complementarity that upholds their differences – in that version, philosophy would supplement literature with self-consciousness. M.P. Markowski, “Poiesis,” XVIII-XIX. “A novel is a Romantic book” (ein Roman ist ein romantisches Buch), Schlegel asserts. This “banal tautology” (RP 173), revealed to be merely original-sounding, is an etymological ratification of the high status of the synthesis-novel, transgressing the rigorous genre specifications of normative poetics (“I shun the novel as long as it is supposed to be a separate genre”; RP 173). Quoted in: T. Ososiński, Ironia a jednostka. Koncepcja ironii u Friedricha Schlegla i Sokratesa (Irony and the Individual. The Concept of Irony in Friedrich Schegel and Socrates), Warszawa 2014, 53. A. Bielik-Robson, Duch powierzchni. Rewizja romantyczna i filozofia (The Spirit of the Surface. Romantic Revision and Philosophy), Kraków 2004, 246. G.W.F. Hegel, Introductory Lectures on Aesthetics, trans. Bernard Bosanquet, Penguin UK, 2004, online edition. M. Finlay, The Romantic Irony of Semiotics. Friedrich Schlegel and the Crisis of Representation, Berlin – New York – Amsterdam 1988, 193. T. Ososiński, Ironia a jednostka, 68. According to Manfred Frank, “irony is a synthesis of wit and allegory”– wit represents its momentary, punctual aspect, while allegory represents drawn-out duration in time (M. Frank, The Philosophical Foundations of Early German Romanticism, trans. E. Millán-Zaibert, New York 2004, 216). Paul de Man conceptualizes the relationship between irony and allegory somewhat differently; he opposes the duration of allegory to the lightning quickness of irony (not wit): “Irony is a synchronic structure, while allegory appears as a successive mode capable of engendering duration.” Paul de Man, “The Rhetoric of Temporality,” in Interpretation: Theory and Practice, ed. Charles Singleton (Baltimore, Md., 1969). A. Okopień-Sławińska, “Ironia romantyczna” (Romantic irony–definition), in: Słownik terminów literackich (Dictionary of Literary Terms), ed. J. Sławiński, Wrocław 2000, 222. T. Ososiński, Ironia a jednostka, 54. W. Szturc, Ironia romantyczna. Pojęcie, granice i poetyka (Romantic Irony. Concept, Borders, and Poetics), Warszawa 1992, 136. T. Ososiński, Ironia a jednostka., 55. Fragment 112 speaks on this subject: “The synthetic writer constructs and creates a reader as he should be; he doesn’t imagine him calm and dead, but alive and critical. He allows whatever he has created to take shape gradually before the reader’s eyes, or else he tempts him to discover it himself. He doesn’t try to make any particular impression upon him, but enters with him into the sacred relationship of deepest symphilosophy or sympoetry” (F 157). A. Bielik-Robson, Duch powierzchni, 200 and subsequently. S. Kierkegaard, Either/Or, trans. Alastair Hannay, Penguin Books, Penguin Books, 1992, 455. S. Kierkegaard, quoted in John Lippitt, George Patterson, The Oxford Handbook to Kierkegaard, OUP Oxford, 2013, 356. J. Corby, “Emphasising the Positive: The Critical Role of Schlegel’s Aesthetics,” The European Legacy. Toward New Paradigms 2010, vol. 16, no. 6, 752. M. Finlay, The Romantic Irony of Semiotics, 169. E. Behler, “The Theory of Irony in German Romanticism,” in: Romantic Irony, ed. F. Garber, Budapest 1988, 44. Behler, “The Theory of Irony in German Romanticism,” 45. A. Bielik-Robson, Duch powierzchni, 208, 210, 216. Paul de Man, “The Concept of Irony,” in de Man, Aesthetic Ideology, ed. Andrzej Warmiński, U of Minnesota Press, 1996, 167. According to Wilhelm Dilthey, one explorer of Schlegel, he was the co-creator of a “new, deeper kind of understanding” based on “the intuition of spiritual creativity.” W. Dilthey, Budowa świata historycznego w naukach humanistycznych (Construction of the Historical World in the Human Sciences), trans. E. Paczkowska-Łagowska, Gdańsk 2004, 207. W. Booth, A Rhetoric of Irony, Chicago – London 1975, 211. Ososiński, Ironia a jednostka, 147. Ososiński, Ironia a jednostka, 149. Schlegel suggests this possibility, but immediately eliminates it, in keeping with the logic of self-creation and self-destruction: “The only way would be to find an irony capable of absorbing all others, small and great, such that no trace of them would remain – and I must confess that in my irony I feel a significant disposition to do so, But even doing that would only help for a short while” (ÜU). Novalis, Henryk von Ofterdingen, ed. and trans. E. Szymani and W. Kunicki, Wrocław 2003, 94. Previous Post: Invented Genres – An Overlooked Problem in Genre Theory?